Provide comfort for the family of David Stowe with a meaningful gesture of sympathy. Father David A. Stowe, past rector of St. John’s Episcopal Church in Somerville, NJ, died on Sunday, January 13, 2019, at New Seasons in New Britain, PA. Following seminary, Father Stowe was ordained as a deacon in 1956 and ordained to the priesthood in 1959. He started his ministry at Holy Trinity Church in Collingswood, NJ. From 1958 until 1959 he served as priest-in-charge at the Church of the Good Shepherd in Acton, MA and later as canon presenter at All Saints Cathedral in Albany, NY. 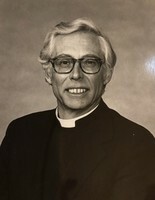 Father Stowe was active in church and community affairs throughout his career. He served on the boards of the Somerset Medical Center and the United Way of Somerset Valley. He was one of three founders of Somerville Senior Citizens’ Housing, Inc., which with the Housing Finance Agency of New Jersey, planned and built the senior citizen housing at 1 Mountain Avenue in Somerville. Father Stowe continued to serve on the board that managed the complex. At St. John’s Church, Father established the Bernard T. Bruckner Grants Committee to provide funding to over 20 agencies and charitable groups in the Somerville area. Father Stowe also served on various committees of the Somerset Medical Center Board of Trustees including the Medical Research Advisory Committee and the West Wing finance campaign. He was a member of the Hospice Sub-committee for the area’s Health Systems Agency. Father Stowe was a member of the Somerville Rescue Squad and the Borough of Somerville’s Human Relations Committee. A past chairman of the Somerville Area Ministerial Association Week of Prayer Observance, Father also organized the annual Week of Prayer for Christian Unity and the Good Friday Pilgrimage. Father also served on several committees for the Episcopal Diocese of New Jersey and on the Alumni Executive Board of the General Assembly. For his service to the church and to the community, Father Stowe was honored by the Somerset Valley Chamber of Commerce as the “Outstanding Citizen of the Year” for 1980. Father was devoted to his family. He was a daily reader of the New York Times, liked working outside gardening and tending to his lawn. He followed baseball and football and enjoyed symphonic music and the music of the church. Father Stowe was the father of the late Corporal Thomas David Stowe, USMC, who lost his life in the 1983 bombing of the US Embassy in Beirut, Lebanon; the son of the late Rev. Dr. Walter H. Stowe, Pastor of Christ Church in New Brunswick , NJ and the late Marguerite Browne Stowe; and the brother of the late Harriet Williams. He is survived by his wife of 64 years Priscilla Lynn Stowe; his daughter Barbara Stowe and her companion George Host; his daughter-in-law Donna Bologa and his granddaughter Samantha Lee Stowe. Funeral services will be held on Saturday, January 19, at 10:30 am at St. John’s Episcopal Church, 158 West High Street, Somerville, New Jersey 08876. Friends and relatives may gather at the church starting at 10 am. Interment will follow at New Cemetery in Somerville. There will be a gathering on Friday evening from 5 to 7 pm with a 6 pm prayer service at St. Andrew’s Episcopal Church, 50 York Street, Lambertville, NJ 08530. Donations in Father Stowe’s memory may be made to St. Andrew’s Episcopal Church, 50 York Street, Lambertville, NJ 08530. To send flowers in memory of David Andrew Stowe, please visit our Heartfelt Sympathies Store. Prayer Service at 6 pm. The Right Rev. William A. Stoke, Bishop of New Jersey Diocese offciating. Rev.Deacon Daniel Somers, Esq., administrator officiating. Provide comfort for the family of David Andrew Stowe by sending flowers.